Ernesto Quiñonez is an acclaimed novelist, essayist, screenplay writer, and oral storyteller for the Moth. He was raised in Spanish Harlem, New York City, by a communist father from Ecuador and a Jehovah’s Witness mother. He is a product of public education from kindergarten to his Masters at the City College of New York where he studied under Walter Mosley. He is a Sundance Writer’s Lab fellow and last appeared in the “Blackout” episode of PBS American Experience. He is currently an associate professor at Cornell University’s MFA program. 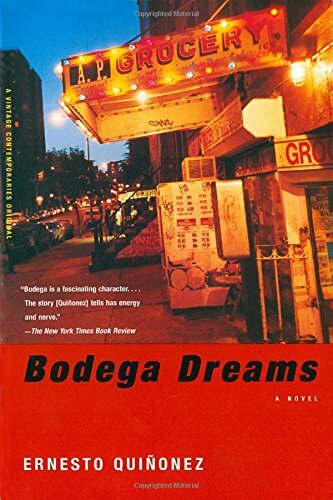 The New York Times claimed his debut novel, Bodega Dreams (Random House), a “New Immigrant Classic”, which has since gone on to become a landmark in contemporary literature and is required reading in many high schools and colleges around the country. 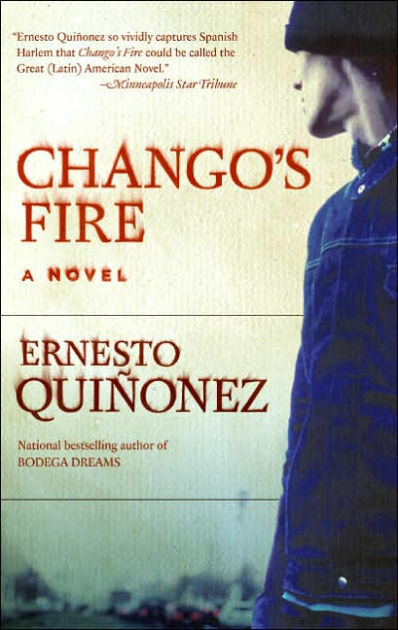 His second novel, Chango’s Fire (HarperCollins) was also well received, the Washington Post declared, “it succeeds in its rich characterizations of the people of the Barrio. Quiñonez ably illuminates the sordid politics of gentrification and the unexpected places new immigrants turn to for social and spiritual support.” His essays have appeard in The New York Times, Esquire, Newsweek, El Pais, Latina Magazine and elsewhere. Ernesto Quiñonez is author of Chango’s Fire and Bodega Dreams. His work received the Barnes & Noble Discover Great New Writers designation, the Borders Bookstore Original New Voice selection, and was declared a “Notable Book of the Year” by The New York Times and the Los Angeles Times. Quiñonez currently teaches at Cornell University. In New York City’s Spanish Harlem, Julio and Maritza are each searching for a path that will give their lives meaning, even if it’s shadowed by controversy. Julio is an arsonist for hire, pocketing thousands of dollars from investors eager to capitalize on more expensive real estate. But when he has reason to stop setting his neighborhood ablaze and vows to change his ways, Julio’s employers threaten his life — and the lives of those close to him. Maritza, meanwhile, has become the pastor of a progressive Pentecostal church — the perfect cover for the scam she’s running. For the right price, she’ll make anyone an American citizen. With a cast of characters as colorful as the city itself, Ernesto Quiñonez brings to life a landscape we can all recognize. Lyrical, inspired, and darkly funny, this powerful debut novel brilliantly evokes the trial of Chino, a smart, promising young man to whom Bodega turns for a favor. Chino is drawn to Bodega’s street-smart idealism, but soon finds himself over his head, navigating an underworld of switchblade tempers, turncoat morality, and murder. The house I’m about to set on fire stands alone on a hill. In this Westchester darkness, it resembles a lonely house Hopper might paint. A driveway wide enough for a truck. A lawn with trees and wide-open space you can picture Kennedy kids playing touch football – their smiles perfect, the knees of their khakis stained with grass. No ocean though, but a wooden porch does wrap itself around the house as if hugging it. Large windows and spacious bedrooms, an American house new immigrants dream of. The type of house America promises can be yours if you work hard, save your pennies and salute the flag. I open the screen door, punch in the alarm code and I’m in. It’s my house, really. The owner doesn’t want it. It’s my house for these precious few minutes. I can indulge myself in snooping through someone else’s life. Walk through wooden floors that I hope to inhabit someday. When I was first hired, I used to enter these houses with my tin gallons filled with kerosene and quickly set to work at wetting the beds, couches and curtains. Light it all up with a flick of a match and quickly take off. Now I look around, wondering why, besides the money, does this person want his house taken out? I pace around. I pick up pictures, stare at the loved ones. I see childhood secrets that were never known to me, secrets of horses and country homes, of summer vacations. I open drawers. Sift through clothes. Read the spines of books and try to find clues about this person’s life. Once I burned a house where an entire set of cheerleader outfits sat in an attic closet, nicely folded. Was his wife the coach? Did he kill these girls? Who knows? I walk around. This house is beautiful but the furniture is outdated, the lamps, doors and closets have old, yellow glows. In the living room, there’s a television with knobs, a stereo with a turntable. Nailed to the wall is a black rotary telephone that hangs like an extinct breed. In the kitchen, there is not so much as a toaster. The wooden chairs in the dining room are chipped, and the walls are crowded with portraits of Catholic saints, of fruits and landscapes. But it is the faded sunflower curtains and dead plants by the windows that pretty much indicates an old woman lived here. Now that she’s been put away, or is dead, this house seems to be used only as storage space, like a huge empty room where broken toys or unused objects from a previous life or a failed marriage sit lifeless. There’s sadness in this house. It feels like its children deserted it many years ago and not so much as even cared to look back. Not a single tear. All around, everything carries such sorrow. A darkness attaches itself to the walls, as if no light had ever shone, even when tiny feet ran around these floors. There’s a sense of neglected space in these halls. I’m stepping on unwanted family history. Nothing in this house has been deemed worthy to be saved or treasured. Everything has been condemned to be erased by fire. But I can’t really say for sure what happened here years ago that has made this house so bleak. But bleak it is. And now that the last of the old folks are gone, their grown children will light a match to unwanted memories. The house gets lit, the neighborhood stays the same color, and the property gets rebuilt with funneled insurance money. Just as well. It’s not my house, nor my memories. Even less, it’s not my place to ask.